Rise and shine! These super soft, spiced whole wheat apple-pumpkin muffins are easy, delicious and only need 1 bowl. Plus, they freeze well! Every morning on my walk with our pup, I daydream about brisker days and all the delicious baked goodies that my oven will be churning out. The summer sun hasn’t stopped me from enjoying these amazing muffins, though. These babies are the most mouthwatering morning treat to hit my kitchen lately! They’re chockfull of spicy aromas and are pretty sinless at just over 200 calories a piece. Not to mention easy to bake, freeze, and tote with you to the office for a homemade breakfast or snack on the go! Now, don’t get me wrong. I love my Austin home and the great life we have here! But hey, a girl deserves to mentally transport herself once in a while. Sinking my teeth into one of these warm pumpkin muffins takes me to a cozy New England cottage with a crackling fireplace and creaky wood floors – just like where we spent the end of last September. Gives me the warm fuzzies… or maybe that’s just the lint stuck to my shorts. Wait… shorts?! Ugh, we’re still a long way off yet. Even if you’re not feeling the fall spirit yet, I know you’ll love these luscious, super-soft whole wheat muffins as much as my hubby and I do. All it takes is one bowl and a little patience after they come out of the oven. Slice one in half, slather on a little butter and enjoy this terrific morning treat for yourself! Here’s to a delicious start to the week with something simple, scrumptious, and just plain wonderful. These muffins have become a big favorite in my house, and I bet after one bite you’ll see why! Preheat oven to 350 degrees F. Line a 12-cup muffin pan with paper liners and spray lightly with nonstick cooking spray. Bake for 20-22 minutes, or until the tops spring back when lightly touched. Cool in the pan before removing from cups. You can also add the chopped nuts into the batter after mixing all other ingredients, instead of sprinkling on top. To freeze: Place muffins in a re-sealable plastic bag or airtight container, then freeze up to 3 months. Let muffins defrost at room temperature or reheat one in the microwave for 30-45 seconds. 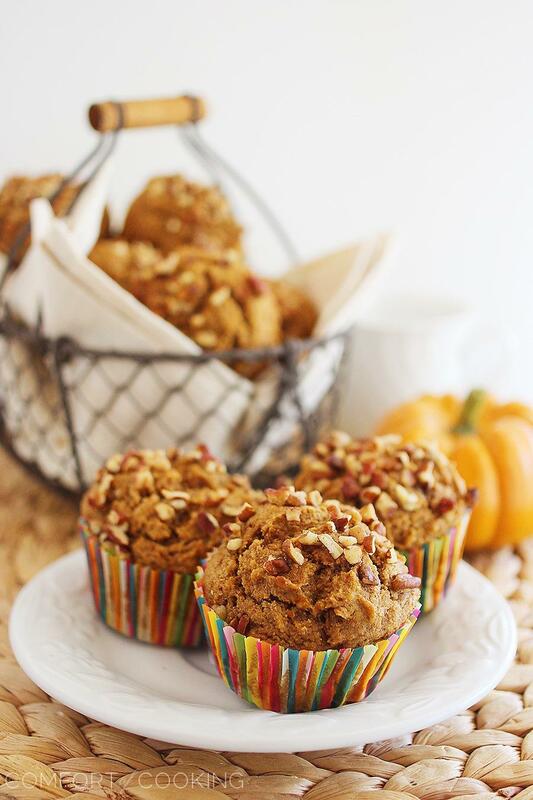 I’m not ready for fall but I adore fall flavors so these muffins are a winner! 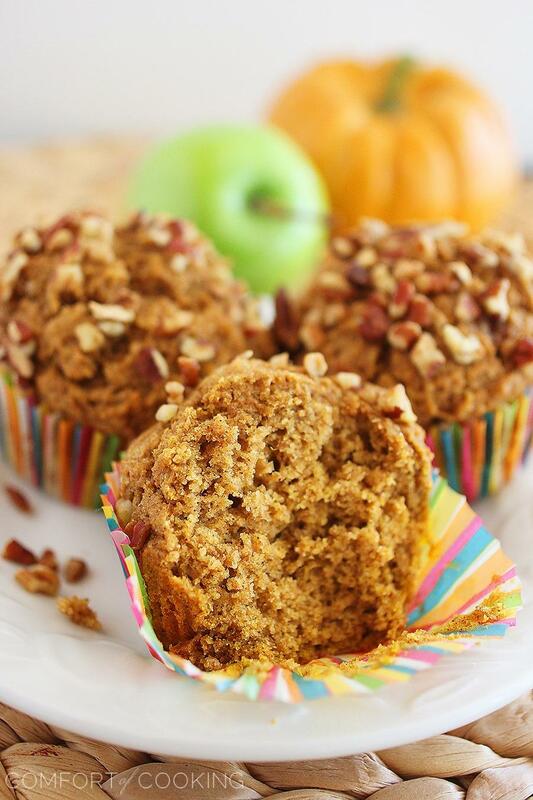 Beautiful apple pumpkin muffins, girl! Such pretty and festive styling with lovely fall colors, too. I’m with you…I adore fall. Cannot wait to start baking for fall and winter. And, I look forward to baking these babies soon. Thanks for sharing! Gorgeous muffins. I love the whole-wheat touch too! And I am so not ready for Christmas either! Time has just been flying by! With the exception of summer produce, I am definitely ready for fall! Now you have me wanting it to come even faster! Love that you used whole wheat flour in these – they look delicious! Beautiful muffins Georgia :) Fall is my favorite season (well, it’s a toss up between that and summer) but I just love waking up to pumpkin first thing in the morning. Pinning these beauties – they are a must try! Fall is definitely coming! And these muffins are fabulous! These look amazing, Georgia! I’m with you on being ready for fall! We had a few days of a “cool front” (read: not 100+ degrees) here in Dallas this weekend and it was glorious! I’ve been trying to hold onto summer for as long as possible but maybe it’s time to give in and embrace fall baking?! These muffins look wonderful! Pumpkin first thing is the morning is my favorite thing. I have to admit that I use pumpkin all year round, so no matter what season I am always using pumpkin! These are gorgeous and I love everything about them! I love making a big batch of muffins and having them for breakfasts throughout the week. This seem like these perfect way to ring in fall (I’m SO ready). I can just about smell those pumpkin muffins Georgia! These muffins look like the perfect way to start the morning! Christmas already? It’s August! That sort of thing drives me nuts. However, if that gets me pumpkin and apple muffins, I’ll reconsider. These look like the most perfect, fluffy muffins! I’m ready for fall baking, too, believe me. It’s my favorite time of year. These are going on my pinboard to try ASAP. Love the whole wheat flour and all those lovely flavors! These look so good, Georgia!! Reminds me of Fall…I can’t believe it’s almost here! I am totally getting into the fall spirit, and especially the fall baking spirit. These muffins sound and look to die for. Definitely a good way to ring in the new season! So pretty! I love that it is almost pumpkin season. Pumpkin muffins have to be one of my favorites! love these! i’m making pumpkin soup tonight because i miss pumpkin and fall so much. can’t wait for it to get here! 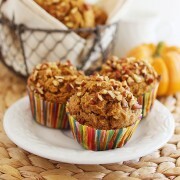 I love everything pumpkin and am going to try these this week for sure. I am like you pretending that it’s not still in the 90’s in North Texas. Pumpkin season arrives! These muffins look scrumptious! The soft and super spongy textures shows through your pictures and it is definitely going in my board..
Gorgeous shots, Georgia! These are the perfect way to start off Fall! I have an apple cookie recipe I love to make in the fall- these look like a step up in the right direction (health wise!) Fall baking is the best; thanks for inspiring me. (and beautiful pictures). There’s nothing wrong with pretending. Surprisingly, the weather has been cooler here in Baltimore. Usually, it’s hot and humid and my hair is a wreck. I’m ready to fall and everything that comes with it. I made pumpkin cheesecake popsicles last night. I just couldn’t help myself. These muffins look scrumptious. The best part of fall – the pumpkin and apple baked goods :). These look so good! Wow – healthy and delicious. Goodness! These look amazing. Hard to do but you have me almost wishing for the cooler Fall weather and all the lovely scents of that season. Beautiful! Even though I’m enjoying a mild August in DC, I can’t help but look forward to the changing of the leaves and fall foods–particularly pumpkin, cinnamon, and stews and braises. Nothing beats it, in my opinion. Okay, these might convince me that maaaaybe the fact that fall is right around the corner isn’t totally a bad thing. :) I love pumpkin! We’ve been having some fall like weather in Atlanta the last couple of weeks. This recipe makes me start looking forward to fall flavors. These muffins are definintely going on my to do list! Awesome post and as always your photos are beautiful! It’s hot and muggy here in Carolina but these give me hope that there are better days around the corner. They look wonderful Georgia! These look amazing! I wish I had a few around to snack on right now – YUM! I love these!! I am SO ready for the Fall. 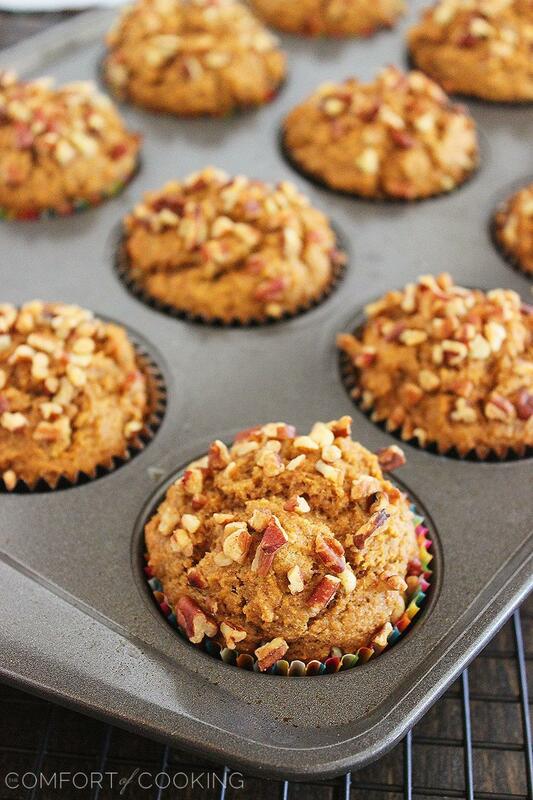 Bring on cooler weather and more muffins! I’m so ready for fall baking too!! These look scrumptious! It’s time to pull out the pumpkin!! Gorgeous muffins! I know what you mean about Fall and Hobby Lobby! Love that place! These muffins make me wish fall would hurry up and get here already. Fall is my favorite time of the year so I’ve been starting early with making fresh pumpkin puree and throwing it in dessert and savory dishes. This post makes me so happy to see both pumpkins and apples – it’s a fall explosion of goodness! THESE ARE AMAZING!!!!! I NEED THEM!! 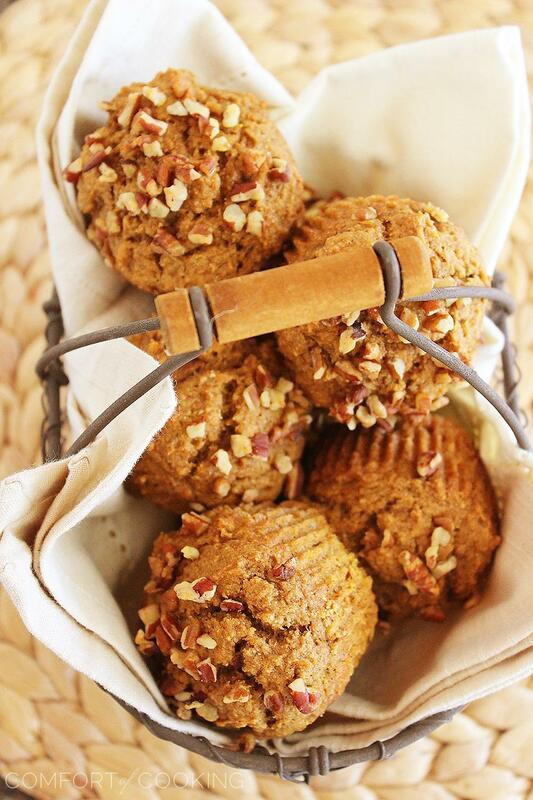 Pumpkin muffins are my ultimate favorite – love the whole wheat in these! Just beautiful, Georgia – pinned! I’m making these soon! Ah I love anything with pumpkin in it, that’s one reason why I am so excited for the Fall. Cheers to this delish recipe and maybe some pumpkin beer in our future too! mmm these muffins sound amazing! I can’t wait to start cooking all things apple! And I hope you get fall weather soon! Fall isn’t really fun when it’s hot. Do you use 2/3 of a 15oz can of pumpkin? I’m not sure exactly, but you should be able to get 3/4 cup out of the small (15 oz.) can of pumpkin. Oh wow! I can’t wait for fall and pumpkin season to officially begin. These look delish! Like the PERFECT texture and everything! Oh my gosh, apple and pumpkin sounds like a great combination! I have to try this! Today is the 1st cool day of fall we’ve had. These are in the oven now! This is the second time in two weeks I have made these muffins for my family. They are absolutely delicious. I feel so good serving these to my kids. We put some warm crock pot apple butter on them too sometimes. Thanks so much for this recipe. To others reading this: if you haven’t tried these please do! They are sooo good! These are really really good! I’ve made them 4 times in the past 2 weeks and every one is asking for the recipe! I just used coconut oil instead of vegetable oil. These are the BEST whole wheat muffins I’ve ever tasted! & they are super soft! I just started baking with whole wheat flour & the results have been nothing to write home about. I will definitely be making these again & again!! Has anyone used stevia as a substitute for the brown sugar? Or what would be a good substitute for brown sugar for these? Made these these yesterday and they are delicious! I substituted the brown sugar with 1/4 cup of Truvia and 1/8 cup of molasses and it worked great. This recipe is definitely a keeper. Thank you! I made these muffins yesterday and took them over to my in laws , they loved them! However I find that adding all spice throws the flavor off a bit! I used pumpkin spice, cinnamon and some nutmeg. So I’m planning on making them again minus the all spice and adding a little more applesauce I am definitely adding this recipe to my repertoire as I love everything pumpkin. Thanks! These are very-very good. Great texture. Will add a little more spice next time. Made regular size and Mini’s for the grandkids. Definitely will use this recipe again and again. This was good. I halved the recipe, added chopped pecans and 1/8 cup of chia seeds to the batter. I baked in a pan for 30 minutes. It needs just a tad more sugar though.